The AG6661 Series of Wireless Thin Clients is a powerful and affordable wireless thin client that delivers the performance and expandability you need. With its dual-video capability built in, the AG6661 enables task workers to work across dual monitors without a splitter cable. The AG6661's robust platform is ready to handle any task. With a dual core AMD G-Series T48E processor running at 1.4 GHz and a Radeon HD 6250 Graphics Processor it has the performance features needed to handle the most complex VDI environment. 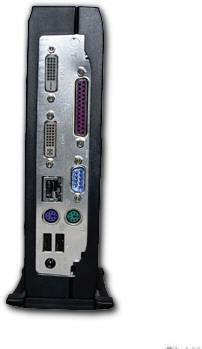 Delivering custom or unique peripheral support with standard parallel port, serial port, two PS/2, 4 USB and dual DVI ports with an included VGA adapter and optional internal wireless. The AG6601W has the tools and features required for deployment into the most demanding of virtual environments. The AG6661 Wireless Thin Client Terminal is a universal hardware platform with universal image support for Windows 7 Embedded (WES7) or Linux out of the box. Citrix, Microsoft, VMWare, Quest and CLI TermPro Terminal Emulation clients are all standard, as is Internet Explorer. In addition, CLI�s Device Manager software is included with each device, making simple and powerful management a reality. The AG6661 combines strong power, performance and flexibility while maintaining efficient power consumption. If you are looking for an Wireless Ethernet "Dumb Terminal" with a Parallel Port, the AG6661 can be configured to act as a "Dumb Ethernet Terminal" just like the ET2000. They can be configured to automatically boot up to a 5250 or 3270 sign-on screen.